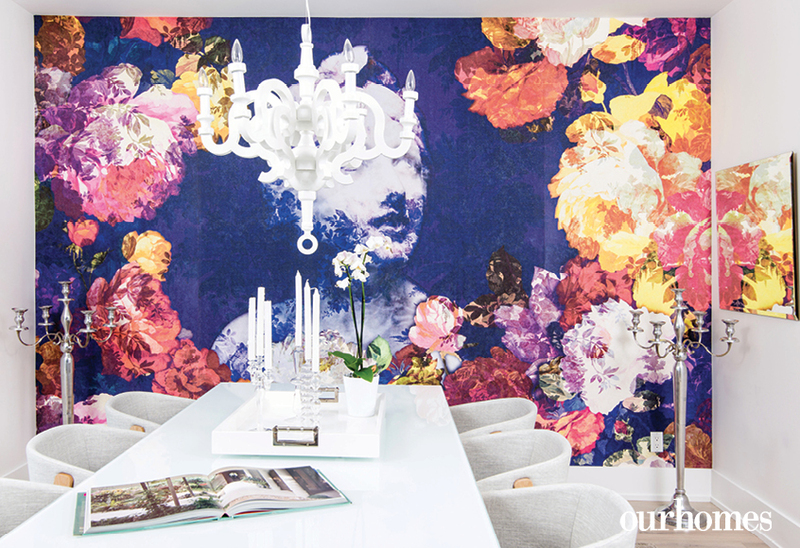 This Windsor-area home is all about the art of colour, originality and playfulness. A version of this article originally appeared in the Summer 2018 issue of OUR HOMES Windsor & Essex County, p38. Find local businesses in our Windsor directory. It’s the mixture of pop culture, retro design references, European (especially Italian) art and culture with dashes of New York and Miami that make the eclecticism of this space so visually stimulating. 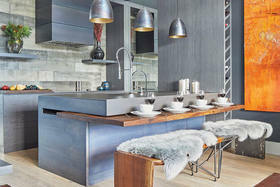 Her new house is a perfect example of the originality and playfulness clients can expect her to bring to all her projects. Inspired by a Hamptons-meets-Malibu beach vibe, Doris has created a house in LaSalle outside Windsor that looks like it could be part of a movie set. “It is my coming out party,” Doris says of her design. “I decided I was going to the beach with this look. I didn’t follow a lot of rules – which is what I love. I challenged myself to work with tone-on-tone, wanted the furniture (Façade Furniture & Interiors) to blend with everything and let the art have a starring role. 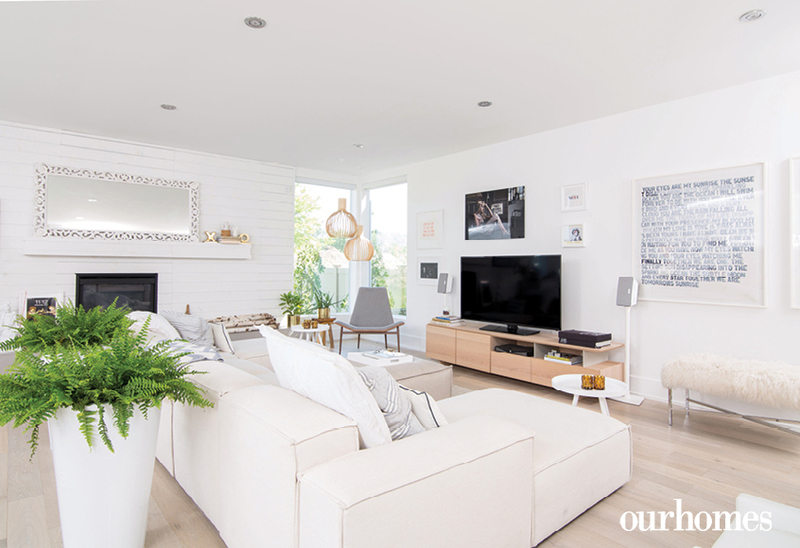 With the bleached, wide-plank wooden floors (Plaza Ontario Marble & Tile Inc.), shiplap on the walls and the whiter-shades-of-pale colour scheme, the home is the perfect backdrop for the surprising and whimsical touches that define Doris’s signature look. 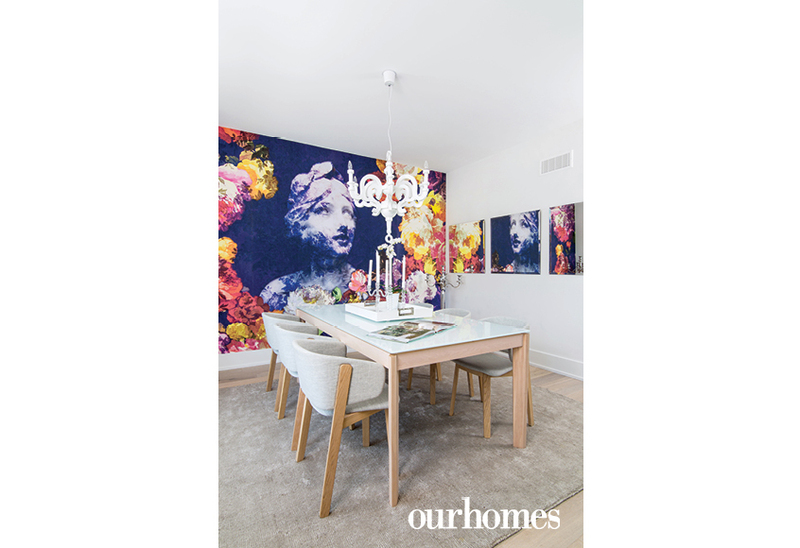 The dining room is defined by an entire wall hung with Italian wallpaper that was custom made for the space. Doris loves the juxtaposition of surprising design elements – the rustic beach vibe with sleek and witty Italian-inspired art; the modern linen sofas with cheeky 60s-inspired hanging wooden lamps; pop art Warhol soup cans with Carrara marble. The kitchen (Frank Cremasco Fine Cabinetry) was designed with the farm-to-table movement forefront in Doris’s mind. “I wanted a casual space, a place where everyone could kick back and relax and enjoy being together eating family style.” The overlong island flanked by 11 rustic stools is exactly that space. A clever butler’s pantry that adjoins the kitchen helps keep clutter to a minimum and allows diners to spread out on the island, pass food back and forth and carry on exciting conversations. 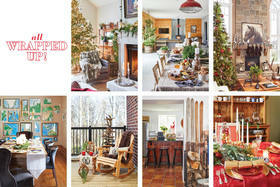 Doris Lapico of Lapico Custom Homes. One of the designer's new favourite trends is bringing outside plants inside. The foyer is dominated by a pair of giant potted Elephant Palm trees. The typographic art is by internationally collected artist Matthew Heller. 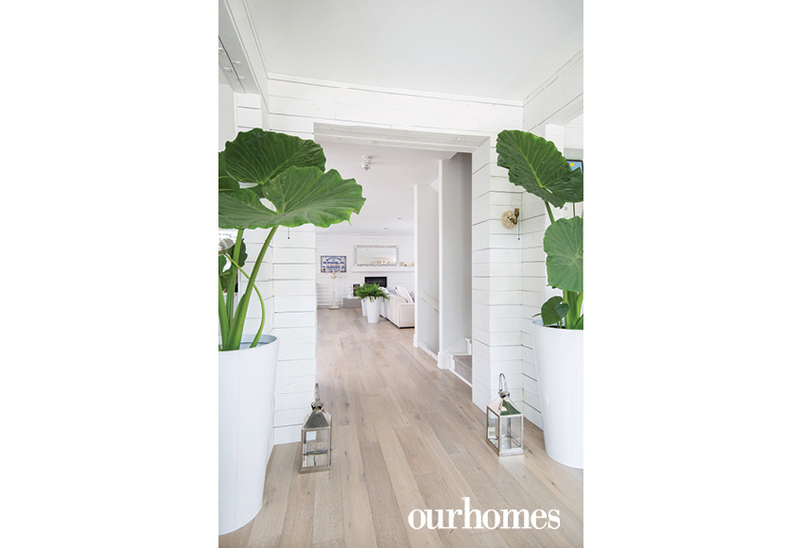 Two strategically placed ferns punctuate the white colour scheme. The dining room is used mainly for wine and desserts when Doris hosts one of her music nights. The Brizo Salona articulating faucet is one of Doris' favourite design touches in the kitchen. 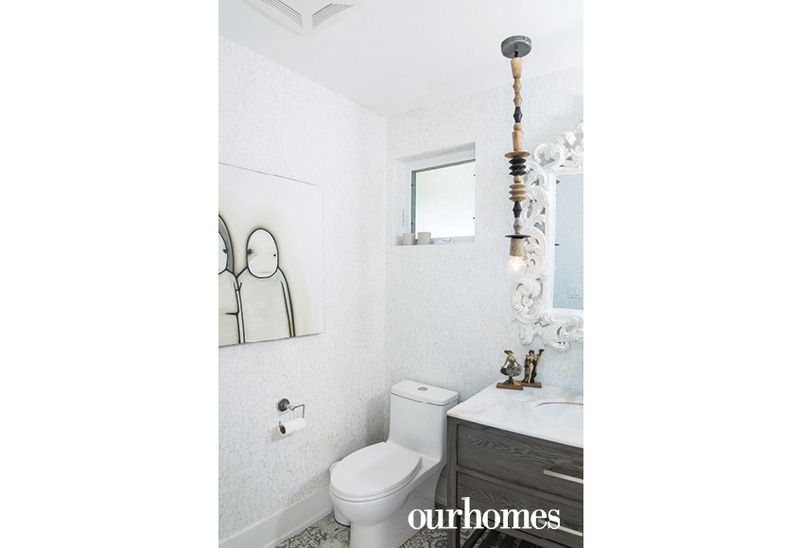 The art and wallpaper in the powder room is quirky and fun. The graphic love lamp and heart pillow are the stars of the show in the master bedroom. The master suite is a nod to 30s glamour. With a soaker tub, a built-in dressing table and a walk-in wardrobe, the room calls up the chic feel of stylish boutique hotels. The stunning crystal chandelier is a surprisingly formal touch in a casual pink and white bedroom. 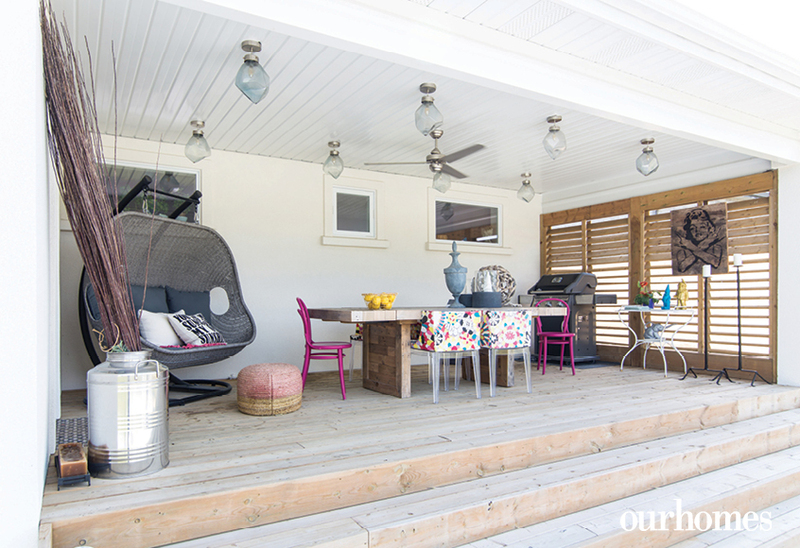 Immediately off the kitchen is a covered patio, planked and flanked with decking-style wood to create both protection from the elements and privacy from the neighbours.